Our Intermediate Recoil Ammunition is suitable for hunting game such as North American Whitetail Deer when you want to use your large rifle, but the typical loads wouldn’t be appropriate. It is also recommended as a transition from the Low Recoil rounds to the full power High Velocity rounds when you are practicing for large game hunting. 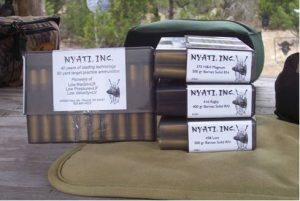 Many of our customers purchase 2 boxes of the Low Recoil, and 1 box of Intermediate when they are preparing for a trip. When spending thousands of dollars for the chance to take that first, most important shot, being confident is priceless.